Thread: Who produced the largest safe plaque? I think if ithey were mine I would have ithem all mounted, dials an all. Then I would stroke them every time I walked past. I assume they're very rare because I ain't seen nothing like these with all the workings as well...nice! Brian is currently finishing a mounted display of one of these to allow people to stroke it at the next exhibition. outstanding (carpentry included) how far north do your exhibitions reach? Rear views, on the left a 5 spindle letter lock with a 12 lever invincible and on the right a 5 spindle letter lock with a 18" fan lock. The next exhibition will be in Telford in October 2017 and then in Nottingham in February 2018 but the 2018 show will likely have a strong Chubb content celebrating 200 years. And roughly when would these locks date to? Well they are both 19th century. The left one: Sn: 160079 for the 5 spindle and 160309 for the 12 lever. The right one: Sn: 139035 on the 5 spindle and 27586 on the fan lock. Chatwood numbers are not straight forward but I'm sure Tom, who is the expert on Chatwood might be able to narrow it down a bit. The addresses on the plates might also give an indication. There is always a problem if you cant see the safe which they came off - Chatwood refurbished locks...indeed they took 5 or however many tonne safes back to the factory to do full-on refurbs of the entire safes. You can get switched locks or new locks and new escutcheons, so you can get an 1890 safe with a 1930's nameplate and locks on, because after 40 years they could need it sometimes! They were still making old style locks to replace worn out ones too, where an update wasnt really required. Both of those 5 spindles and the 12 lever lock all seem to be 1906-1916, while the fan lock was made in the Spring of 1875. They were top of the range locks although would have been a bit old fashioned at that time on a new safe. 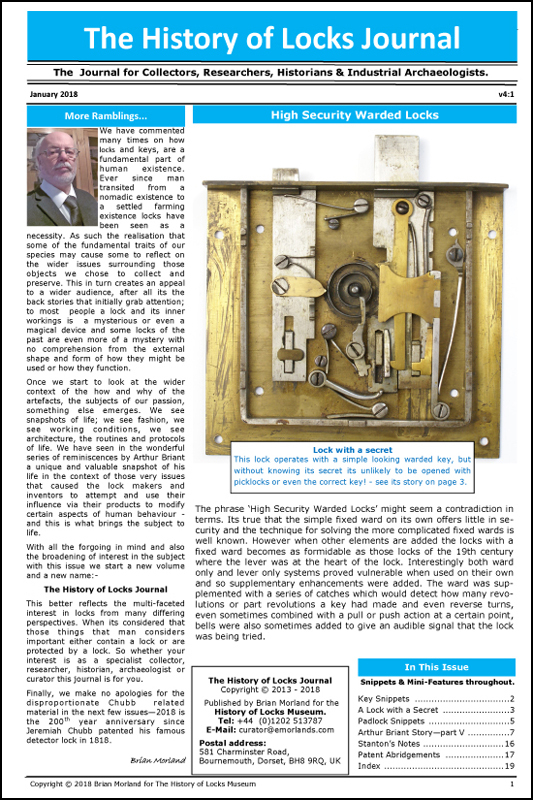 The new locks which they could have fitted were cheaper and smaller - which wasnt for sure what the customer wanted, in Chatwood's market sector, but they they may have been just replacing existing locks like with like on an older safe. What an interesting and informative reply Tom. The last company I can recall that 'honoured' their products to that degree was probably Parker pens, but from memory even their services finally succumbed to the "bin it and buy a new one" concept back in the 1990's.